A first in South Africa, the new Rhodes Tomato & Onion Gravy product is a versatile offering that can be used either as a ‘heat & eat’ or as a ‘cook-in’ sauce. The Tomato & Onion Gravy is an extension of the Tomato & Onion mix product, and the Rhodes’ tomato philosophy – Real Tomatoes, Real Simple, No Preservatives – that underpins the brand’s revamp to offer consumers “more delicious and pure convenience and value, and improved recipes to ensure a better taste experience”. The Rhodes Tomato Puree, in addition to being available in a can, now also comes in a smaller, more convenient plastic cup. This offers consumers a convenient, once-off use, while still being preservative-free. The Rhodes Braai Relish range includes a new and exciting extension of Braai Relish with Sweet Chilli and Braai Relish with Green Pepper. The Rhodes Chopped & Peeled range now offers the consumer an improved recipe and more benefit in two new popular flavours: Chopped & Peeled tomatoes with Fresh Garlic and Chopped & Peeled Tomatoes with Green Pepper. 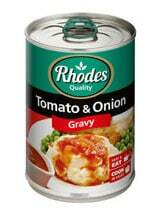 The Rhodes Tomato International range uses improved recipes to ensure a more authentic taste. Rhodes Italian Style is a welcomed addition to the range of Mediterranean Style, Mexican Style, and Indian Style. Packed with flavour, the range is ready to be used as is, over pasta, couscous, nachos, or rice. Canned tomatoes are the perfect cupboard staple, perfect for curries, hearty soups, and sauces. Quick and easy recipes are included on the back of each can to inspire you. All products are Halaal and Kosher, and the new range includes Easy-Open cans, so look out for the Rhodes green tabs on all new products.